In the Muslim imagination the image of Muhammad is sacrosanct. He is a sacred symbol. 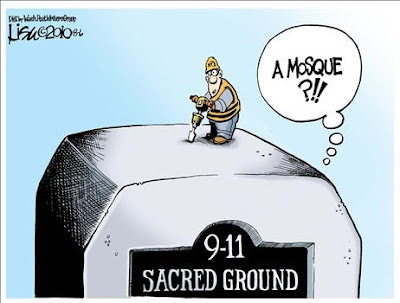 Since the site of the Embassy is considered a sacred ground by all nations, it is only natural that Muslim protesters would react to the defilement of Muhammad by invading America's sacred space in their countries: the U.S. embassy. I'm not saying it's right, but we must put the actions of these protesters in context. Denying reality escalates conflict. Why is invading the American embassy forbidden, but U.S. bombing of villages on a daily basis in the Muslim world is okay according to the mainstream media? Either both spaces are sacred, or neither are sacred. If the hijacked U.S. governments wants to live by the law of the jungle, and create chaos everywhere, then it cannot complain when it comes under attack by wild fanatics. The hijacked U.S. government is run by wild fanatics who have contempt for the rule of law and use terrorism to achieve their political goals. American "diplomats" in the Middle East are regime-change assassins who arm radical Islamic groups and sponsor terrorism against civilians. They are not sweet and innocent doves who actually care about the countries they're in. The U.S. government has no moral ground to stand on. It forfeited the right of being included among civilized states when it murdered 3,000 of its own citizens along with the Israeli government on September 11, 2001. Washington and Tel Aviv do not represent civilization because they frequently violate international laws and international norms. The heart of their argument that they are in a war against "Muslim barbarians" is based on a lie. There is no civilization on this planet. Savages control the Western world and the Muslim world. The only difference is the savages of America, Israel, and the West have nuclear weapons and otherworldly weaponry, while the savages of Islam have stones and slingshots.